FOUR SEPARATE HURRICANES were stirring up the atmosphere south of Florida on the last Saturday in September, but it was sweltering hot and still in Amherst for the UMass Minutemen’s first home football game, to be played against the SUNY Buffalo Bulls. Male cheerleaders the size of Mark McGwire tossed their female counterparts twenty feet high in the air, lazily, as the seats on the UMass side of the Warren McGuirk Alumni Stadium began slowly to fill up. Outside the stadium walls, however, a momentum was building. The Minuteman Marching Band, which had been winding its percussive way down from central campus for the past half hour or so, was arriving in a triumph of brass and drumrolls. A handful of fans with video cameras leaned over the stadium’s north rim, recording the band’s approach. Led by a four-man “colonial guard” in white hose and tricornered hats, and a small squad of drum majors spiffy as martinets in their gleaming white uniforms, two dozen drummers strutted into the stadium, followed by three men smartly turned out in business suits: director George N. Parks, associate director Thomas Hannum ’84 M.M., and assistant director Michael Klesch ’90 M.M. Finally, marching eight abreast and with great aplomb, came some 300 musical troupers, the ranks of the Minuteman Band: the color guard in black with their bright flags and banners, the musicians in crimson coats, tall, visored caps, and black trousers, with the tuba players those rodeo clowns of the Marching Minutemen sporting black berets and Blues Brothers shades. The Minuteman Band, as MacRostie informed the crowd with gusto, is this year’s recipient of the Louis C. Sudler Trophy of the John Philip Sousa Foundation: the nation’s top award for a college marching band. “LET’S GO UMASS!” screamed the cheerleaders, turning their attention to the stands for the first time, as the fans including the minority faction of Bulls supporters huddled on the west side burst into cheers and applause for what we if not George Parks are willing to boast is the best band in the land. Clearly, in the words of an old bluesman, this ain’t no side show. THE SUDLER TROPHY, it should be understood, is to the world of marching bands what the Heisman Trophy is to that of football. The usual winners accompany Division 1 football teams, the kind of teams who compete before massive crowds and whose games are televised nationally. 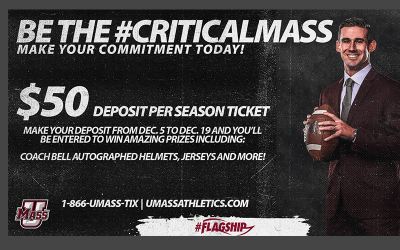 The UMass football team belongs to the second tier, Division 1AA, and plays to smaller crowds in smaller stadiums. Nothing about the Marching Minutemen could be called “smaller,” except perhaps its budget. The largest college marching band in New England history, it consists of some 350 brass players, wind-instrumentalists, percussionists, and assorted other personnel. Band members don’t get scholarships like those at some bigger schools, but no one who wants to be in the Marching Minutemen, and is willing to do the work, is turned away. 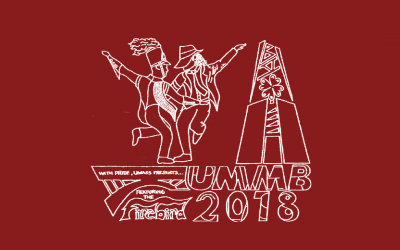 The band has its own Internet site (www.umass.edu/band) and its own small but fervent cadre of student managers and publicists. At the same time, the Marching Minutemen undeniably lack some of the usual accoutrements of a celebrated, big-time act. Their uniforms, for example, may look classic, but that’s partly because, at eighteen years old, they’re certifiably vintage. And band members or “bandos,” as they refer to themselves don’t stay at fancy hotels when they go to out-of-state events. They don’t stay at hotels at all, but in sleeping bags spread out on gymnasium floors. When they played at UMass President William Bulger’s fund-raising gala in Boston in September, they received an unprecedented $8-per-person meal allowance. “Amazing,” Parks termed this largesse. Last year, the Marching Minutemen even got kicked out of their longtime clubhouse, the campus’s iconic Old Chapel, currently closed for renovations. That one hurt, says Parks of the bandos’ necessary exile from their beloved home. And yet the band’s tenure at its current spread-out headquarters (the main office is in the University Apartments, the practice space is Grinnell Arena) has coincided with its greatest honor: its one-year reign, which can never be repeated, as holder of the Sudler Trophy. 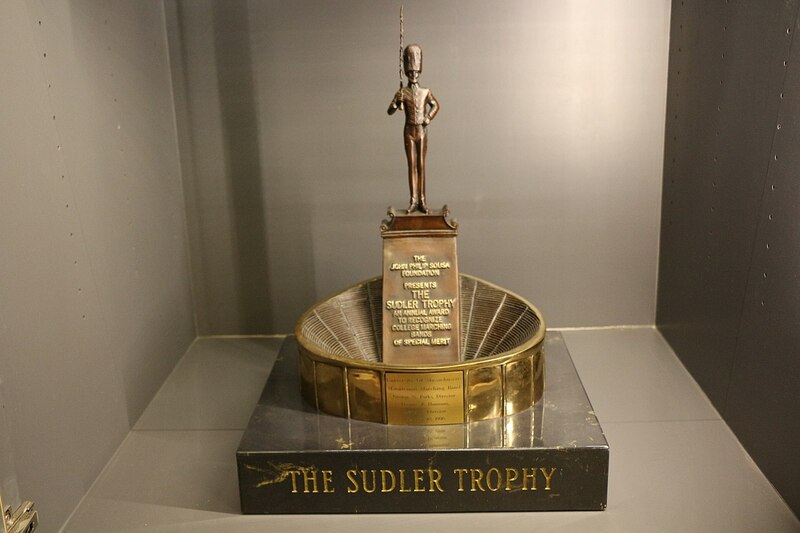 Each year, band directors from across the country vote to determine the recipient of the Sudler Trophy. Ken Ozzello, drill coordinator of the University of Alabama’s “Million Dollar Band” a big-time band at a big-time football school says he “absolutely” cast his ballot for the Marching Minutemen, which of the seventeen bands who’ve won the Sudler Trophy is associated with the smallest football program. ENERGY, ENJOYMENT, understanding of excellence: all of those were evident in the band’s performance at the UMass-Buffalo game, at which the Minutemen football team, itself an up-and-coming entity, cleaned up 51-27. But the bandos project another quality that’s a little harder to sum up in a word. The way they play swinging their instruments right and left in unison as they march is sassy. The trio who hang around the end-zone during the game doing pantomimes, shooting off little foot-long cannons with out-sized booms is a little tongue-in-cheek. There’s a gentle, antic irony about the whole performance. This is a band, in short, with attitude. The attitude they project is one of pride in doing a good job: members clearly take their role as entertainers seriously. “Every time we have a performance, Mr. Parks announces we’re the Sudler Trophy winners,” says Beth Engwall, a freshman euphonium player from Bristol, Connecticut. “It’s a lot of pressure, but it makes you feel proud.” Parks, for his part, believes “attitude is everything. The band is much more than a marching band anymore. It’s closer to a stage show.” Parks himself, an impish-looking strawberry blonde, projects star quality. At least at football games, he never stops moving. There’s nothing vaudevillian about this year’s halftime show. Based on the musical West Side Story, it’s a sophisticated, edgy, even frenetic musical presentation in which the musicians simulate the chaotic energy of a gang war. At one point, members of the musical troupe tear across the field pretending to strike each other with their horns. At another, twenty or so members of the color guard, recalling the character of Maria, gracefully thread their way through the choreographed disorder, furling and unfurling bright, translucent flags that glisten in the sun. When it’s over, the crowd stands up and cheers. At lots of schools, remarks one spectator, people leave the stands at halftime to buy hotdogs, stretch their legs. Not at UMass. For some, halftime is the main attraction. For the twenty-two years he’s been director, Parks has worked tirelessly to convey this concept to the band. The way you can tell they get it is in the details, he says for instance, the way none of them unbuttoned their uniforms or otherwise betrayed that the heat was bothering them on the sweltering hot Saturday the Minutemen met the Bulls. AT 5 O’CLOCK IN THE AFTERNOON on Band Day, October 10, Minuteman Band director George Parks walked onto the floor of the 10,000-seat Mullins Center. A banquet was about to take place to celebrate the arrival of the Louis Sudler Trophy, the top collegiate marching band award in the country. Parks had come directly from Alumni Stadium, where 4,000 thousand high school students from more than eighty towns had joined his Marching Minutemen on the field, in the pouring rain, to belt out “America the Beautiful” and the theme from Titanic . He hadn’t had time to change the soggy suit he was wearing as he climbed the twenty-foot podium that’s required to conduct a football field full of musicians. His red hair was wet and tousled, and he looked tired. He disappeared within minutes. It was almost two hours before before he returned to start the program at the Mullins Center. No one had really wondered what was happening; probably most of us assumed dinner was late because it’s complicated to feed a thousand people. But the real complication was that George had heard there were buses full of kids stuck in the mud up at the stadium. Campus Center catering manager Joe Corso was ready to order his staff to serve dinner when George asked for help getting pizza and juice to the kids. The banquet wasn’t a fancy or even very organized affair, and the program didn’t run as smoothly as one of George’s lavishly choreographed drills. People were thanked with plaques and kind words for helping the band reach its current state of prominence. Former directors Joe Contino and John Jenkins addressed the gathering. A representative of the Sousa Foundation spoke feelingly of America’s love of marching bands, and warmly of the Marching Minutemen. Linda Hannum `82, former drum major and the wife of associate band director Thom Hannum `84 M.M., had produced a video for the evening. Set to Barbra Streisand’s version of “There’s a Place For Us,” from West Side Story and this year’s halftime show, it was much like a treasured home movie, capturing many of the happy, silly, triumphant, and proud moments of the band. As with the buses stuck in the mud, few of us realized that Linda had just three days to put together the video, when George dropped off twenty years worth of film on her doorstep. A good band is a good team a collection of individuals following the rules and embracing a discipline that makes the whole greater than any one part. Since 1977, when he walked onto campus at the age of twenty-four, with a Tasmanian Devil-like energy still with him and a big dream for the Minuteman Band, George has inspired others by working as hard or harder than anyone around him. As a result, everyone around him would do just about anything for him. But he seldom asks. For Serious Whistle-Blowers, There’s Just One Question: With or Without the Pea?